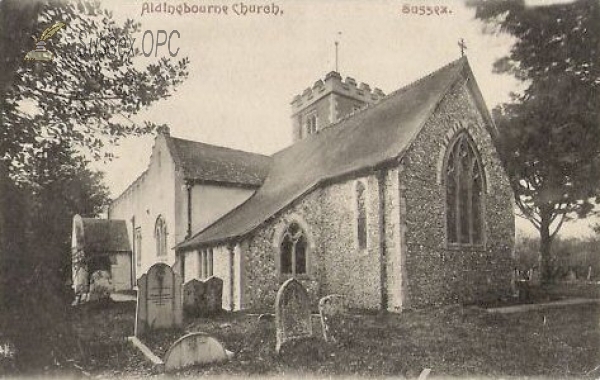 Although Aldingbourne is a small village, the parish is large being about 6 miles long and 2 miles wide. It contains Norton, Nyton, part of Fontwell, Westergate, Woodgate, Lidsey and Aldingbourne. The village is mentioned in the Domesday Book and takes its name from 'Elda' a Saxon Chieftain, and means Elda's home by the stream; it is probable that the Rife which runs up to the back of the Church was originally navigable for Saxon boats. The Bishop's Palace stood in a large park roughly bounded by Nyton Road and Westergate Street, and included Mill Pond, which was kept well stocked with fish for the clergy! The Palace was destroyed by Parliamentary Forces in 1642, but the remaining mound is still visible. There is evidence that there were once several houses in the vicinity of the Church, but after the Black Death in 1359 the people moved away to the next stream, the Rife, which now acts as the boundary between Eastergate and Westergate. St Mary's Church is a Grade I listed building, over 900 years old with an early English chancel; the aisle was rebuilt in 1868 when the chancel was restored. The Church has two fonts; the oldest is late Norman, being circular in shape and resting on a large central pillar. The nave is separated from the south aisle by an arcade consisting of four Early English arches. There is a side altar on the south side, St.George's Chapel, with a commemorative Roll of Honour. The window in the south wall of the Church by Christopher Webb is in memory of Admiral Sir Reginald Skelton, who accompanied Scott on his first voyage to the Antarctic. The church has recently been the subject of a survey by NADFAS (The National and Decorative Fine Arts Society), and a copy of the document is held at the Church. The tower houses five bells. The Battle of Britain wartime airfield, Tangmere is on the edge of the village. 769 individuals in the OPC Database for the 1841 census. Grid reference: 492500, 105500 ~ View on: Google Maps, Open Street Map, Streetmap, National Library of Scotland Map or Oldmaps. The OPC has a complete history of every person killed in conflict from 1914 to date, including where they were born, died, where they lived and worked. The OPC database contains 36 poll register entries for people entitled to vote in this parish. There are 109 protestation returns for this parish in the OPC database.